George Alfred Schastey Jr. graduated from the Ecole des Beaux-Arts in Paris in 1891 and returned to New York to begin his architecture practice working for William Baumgartner. In 1907 Schastey formed Schastey & Vollmer in San Francisco, a firm specializing in interior decoration, furnishings, and hotel equipment. The partnership lasted until 1910; Schastey practiced independently for the rest of his career. Schastey worked on numerous commissions for Herbert Edward Law including the interior of San Francisco’s Fairmont Hotel, the sprawling Lauriston Estate in Portola Valley, California, and daughter Patricia Law’s "Homestead". Schastey designed commercial and residential projects in San Francisco, Reno, Nevada, and Sea Cliff, Calif. The George A. Schastey collection consists entirely of drawings relating to the Lauriston Estate in Portola Valley, California. 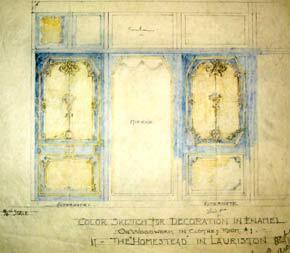 Drawings consist of sketches, working drawings, full-size details, and presentation drawings for the original residence, Villa Lauriston, the Patricia Law Homestead, and the administrator’s residence. Also included are structural blueprints by Edward G. Bolles of Schrader Ironworks.